Keep Your Magic Alive in this Large, Beautifully Illustrated & Lined Book of Shadows. This book has over 300 unique images, each page hand designed and illustrated by Author/Designer Starrfire Price. The pages are held on heavy stock, natural paper with parchment like etching on every page. This book is absolutely beautiful! The Front Cover is richly designed with deep blues swirled into black etching w/ antique gold tones. 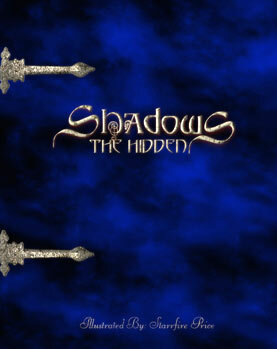 Shadows, The Hidden is the latest addition to our world renowned beautiful, unique journal/magical books. With over 380 lined pages, most etched with Starrfire's Inspired Illustrations, together with beautiful separator pages.. You'll have plenty of room to keep all your magical and special information. Each page was hand designed to create a magical journey with each flip of the page. Shadows also has special back reference sections featuring; New & Full Moon Phase Dates through December 2009, Herbs Section, Crystals & Stones.